Still a mindful eating challenge-- my favorite raspberry licorice. Six years ago, I went to visit a friend from college who was teaching English in Kyoto, Japan. A day or so after I arrived, she took me to an outdoor market in the city. Wandering together through stalls of artwork, antiques, handicrafts and food, I was drawn to a table where a woman was selling daifuku, sweet rice cakes filled with red bean paste. As my friend spoke Japanese and I did not, she kindly did the work of ordering one for me. The woman handed me the rice cake, and walking away from the stall, I drew the soft, chewy dessert to my mouth and took a bite. My friend looked at me in horror and told me I needed to stop. I looked at her quizzically. She told me I couldn’t eat the daifuku just yet. I needed to wait and sit down to eat the rice cake. I was still confused. My friend sighed and explained that it was considered rude to the food – and to the person who made it – to eat while standing or walking, when my attention would clearly be focused on other things. It had never before occurred to me that it was possible to be rude to something I ate. Mindful eating can be a powerful practice. In the same way that yoga asks us to pause and become fully aware of each breath, so too mindful eating develops a greater awareness and understanding of each bite – to truly observe the act of eating, and the food itself. Like breathing, eating is a basic, life-giving function that we do everyday. But we don’t always think about the practice of eating. Shortly after I moved to New Zealand, I attended a yoga therapy workshop with Libbie Nelson, an Australian-based yoga teacher and physiotherapist. As part of the workshop, she gave each participant a single raisin. Raisins have never been among my favourite foods – their shriveled texture, dryness, and brown colour never quite appealed to me. In my mind, all raisins were the dry, stale things that I remembered from school lunches at primary school, and that I hadn’t really eaten since. But here it was, a raisin placed in my hands, and the assignment to meditate on it for 10 minutes. Cupping the raisin in the palm of my hands, I realized that I’d never given that much attention to a single morsel of food in my life. The colour and stickiness of it still wasn’t terribly appealing to me, but the raisin was plump and fragrant. My mouth began to water. Towards the end of the meditation, we were told to go ahead and eat the raisin. And to keep chewing longer than I had imagined possible for just one tiny raisin. I felt as though I was eating a raisin for the first time. It was so much better than I could have imagined. Soft, sweet, and flavourful. I haven’t avoided raisins since. Mindful eating requires us to slow down. To actively contemplate the food, observing its scent, aesthetics, texture, flavour, and purpose. To intentionally and consciously chew each bite, and feel the muscles of the throat working as we swallow. To pause between each bite. To truly allow the food and the act of eating to be the focus of the meal. In recent weeks, there have been a number of articles about mindful eating as a possible solution to our food issues as a society. It’s all too easy to lose our connection to the food we eat, and how we eat it. We may feel rushed and eat on the go, consuming what’s convenient, rather than what’s actually nourishing. We learn to block out signals from the stomach, suppressing cravings, rather than trying to really understand them and determine what the body is actually calling for. And who among us hasn’t eaten something because “it’s there,” rather than because we’re actually hungry for it. There can also be strong emotional attachments to certain foods, which influence our eating practices as well. One day I discovered that my local health food in the United States store carried RJ’s Natural Raspberry Licorice, which is of course made an hour or so north of Wellington in Levin. To say that I developed a minor licorice obsession is not an exaggeration. I always had a bag on hand. 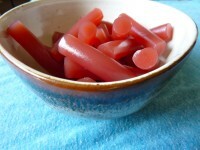 And when I missed my partner – which was often – I turned to the licorice. Since I was buying it from the health food store, I didn’t give it a second thought. It was actually my wallet that made me begin to question my licorice habit. My grocery budget didn’t allow for an extra $10 per week for licorice. When I stopped to observe what I was eating and how it made me feel physically, I realized that eating a few pieces of licorice was fine. But eating half the bag in one sitting made me lose the feeling of well-being and prana in my body. It made me feel kind of gross, actually. And I still missed my partner just as much! As I became more cognizant of my licorice eating – and why I was eating it – I was able to cut back to a more moderate amount, and enjoyed each piece of licorice even more as a result. It’s still one of my favorite treats, even with my partner right here beside me. Over the next few weeks, I invite you to build an awareness of the act of eating. To create a baseline for observation with whatever foods you’re currently eating. What would happen if you stopped to really contemplate a single raisin, or a bite of food for even just one minute before actually eating it? Not questioning the value of the food in anyway, or whether you should eat it, but just actively observing the food. And perhaps begin to observe your practice of eating, as it currently is. If you tend to eat meals with music, tv, or other sounds in the background, try turning them off. Allow yourself to slow down and observe the aesthetics of the food in front of you before you dig in. Notice the colour, texture, and aroma. Take a moment to consider the source of the food. If it’s a vegetable or fruit, imagine the plant that it came from. The person who picked it. The path and distance it traveled to make its way to the plate. If it’s a meat, consider the animal it came from. Consider how the food was cooked. And when you do take that bite, allow yourself to slow down and chew it fully, allowing the flavours to permeate the tongue. And offer yourself understanding and compassion. Maybe a few bites of mindful eating is all you have time for at first. It’s been said that self-observation without judgment is the highest practice of yoga. It’s a challenging task on the mat, and it can be even more challenging at the dinner table. Each of us has patterns, or samskaras, which relate to food and what we eat. Allowing yourself to begin to observe your patterns, and to become mindful and truly focus on the food you eat can feel uncomfortable at first. And it can be challenging to take the “shoulds” and the guilt out of it. But we can at least give it a try. 1. “Mindful Eating” Psychology Today, February 2009. 2. “Mindful eating as a Way to Fight Bingeing” The New York Times, 8 February 2012. “Could Mindful Eating Wean us From Our Bad Food Habits?” The Huffington Post. February 2012. Mindful Eating: A Guide to Rediscovering a Healthy and Joyful Relationship with Food. Dr. Jan Chozen Bays. Valerie Love’s passions in life are yoga, food, and travel. She also believes in trying to make the world just a little bit better. A transplant from the US, Valerie teaches yoga at Brooklyn Community Centre in Wellington and blogs about her adjustment to life in New Zealand. I use craisins in my Yoga, mindfulness and weight loss courses but I don’t think it really matters what you use. It’s a real eye-opener for most people. It gets them thinking about what other pleasurable activities, besides eating, they are missing out on in life because they are stuck in the past or the future. Powerful stuff! Thanks for reading! It definitely is powerful stuff. Thanks, Susanne. Glad you enjoyed it!